Technologies are changing very fast. A TV purchased a year ago is already too old, and buying a new one is both expensive and pointless, as the old one still has good picture. Thanks to media players one can easily fix the situation, extending features of the TV. After connecting a small "box" to the TV, we can play movies in virtually any format, listen to music, browse YouTube, watch online TV, and much more. Among recognized leaders of multimedia players one can single out Dune and its usual competitor, Popcorn. At the beginning of 2013, a new revolutionary model, Popcorn Hour A-400, was released. It's the first (!) media player that can play 3D movies (full support for ISO 3D Blu-ray is included). It uses a more powerful (compared to Dune) 2-core processor, Sigma Designs SMP8911, and allows managing movie collections with the help of free iPad and Android applications, replacing the usual remote control. An interesting feature of the player is its ability to scan your video files and download movie covers and some basic information (synopsis, actor list, etc.) automatically. These data can be displayed in two different modes: Filebrowser or Jukebox. 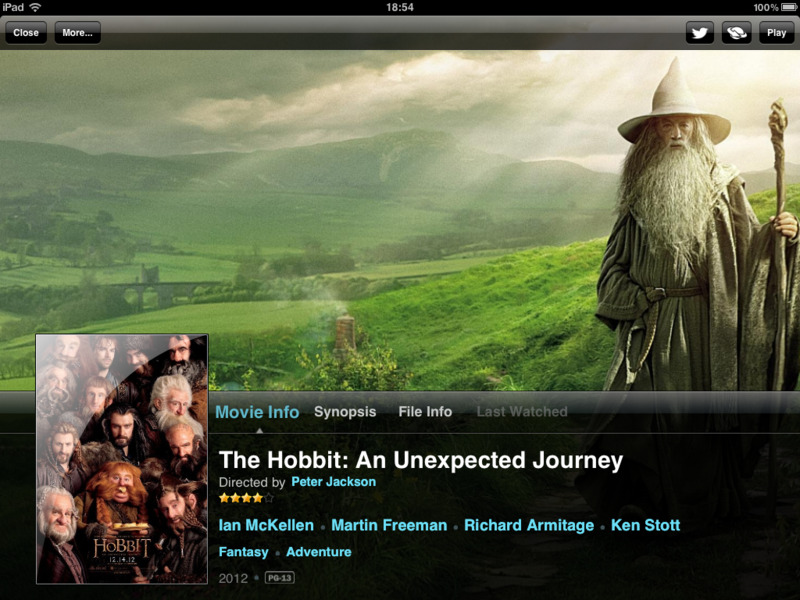 In the Filebrowser mode, when you navigate through the list of your files, a cover for the selected movie is shown. If you press the "i" button on your remote, a big background image from the movie with additional information will be displayed. You can also illustrate your movie collection manually. If your video file has a filename like avatar.mkv, you can copy a picture and save it as avatar.jpg. This picture will be recognized by the player as the cover of the movie. Additionally, avatar.fanart.jpg, if available, will be used as the background image. However, it is more comfortable to select movies in the Jukebox mode. On the TV display, covers of all your movies will be shown in several rows. It is possible to apply filters, for example, to select only TV series. Or show movies by a certain genre, year, rating, etc. If you have a very big collection, the search feature will be quite helpful. 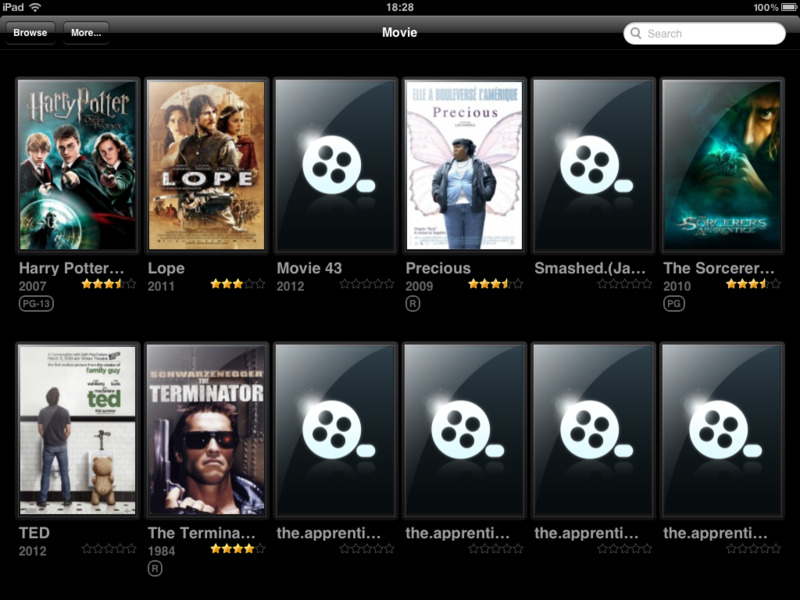 By the way, on iPads and Android devices movies are displayed in this mode. And using these applications is way more convenient than pressing buttons on the remote. It is difficult to express the delight of leafing through movies with your finger, it's like you feel them, enjoying bright covers and reading descriptions. If you click an actor's or director's name, movies from your collections by this director or with this actor will be displayed. Very cool! Many files of TV series were detected as individual files, covers were not found, there are no background images, some movies were detected incorrectly. This catalog is hardly what we'd like to see or use. If you check how much time is required for each operation, you will find out that the automatic scanning of Jukebox takes longer than adding movies to Movienizer and creating a Popcorn catalog. 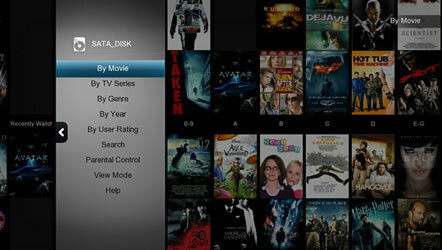 Besides, with Movienizer your TV series will remain such, and your movies will be movies with covers and backgrounds. If you wish, the downloaded information can also be edited and adjusted manually. Furthermore, there will be a powerful tool for managing your movie collection at your disposal, with the ability to create reports and lists, find movies by a number of criteria, rename video files, and more. 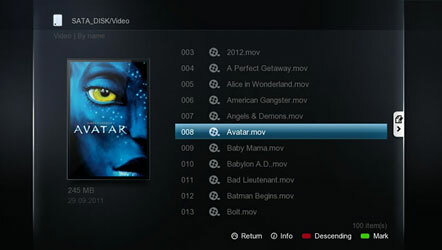 Movienizer can create movie catalogs for other players, too: Dune HD, WD TV / Google TV. It also includes a plugin for Windows Media Center.